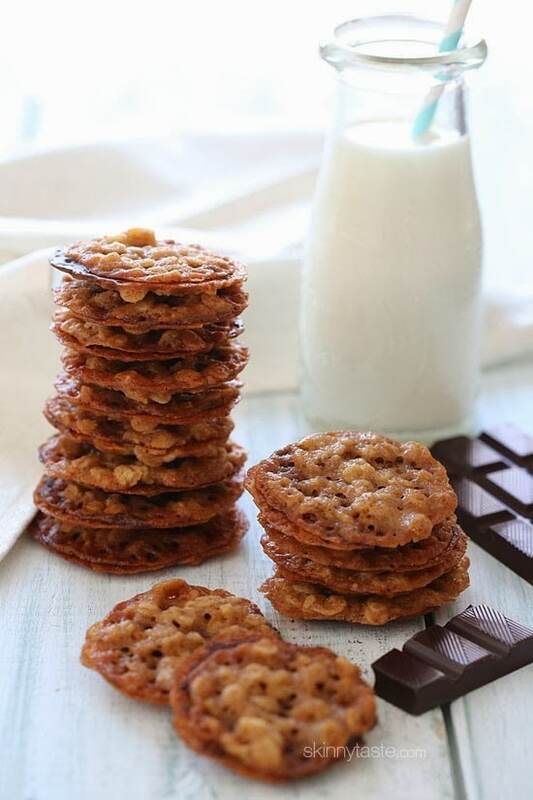 These delicious dark chocolate oatmeal lace cookies are light, crisp and chewy, made with basic ingredients like oats, flour, butter, sugar and spices– then once baked they are sandwiched together with melted dark chocolate. 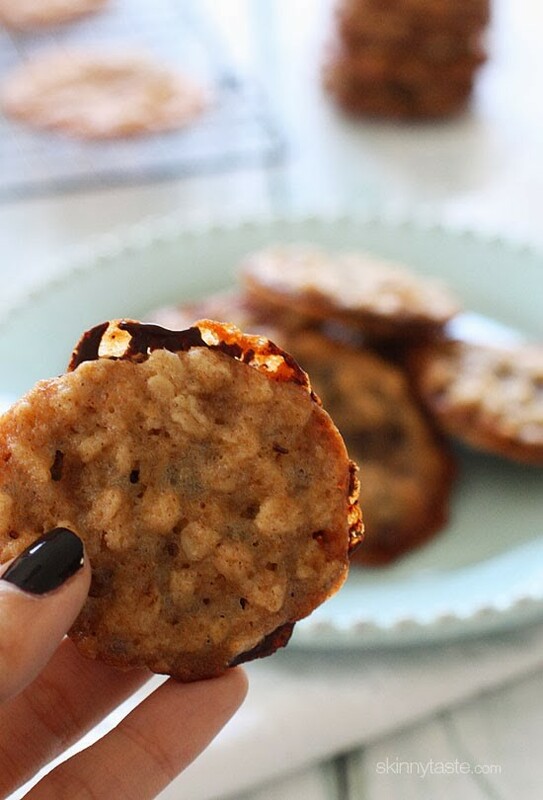 If you’re baking cookies for Holiday parties, or just to leave Santa, these are a must! These delicious cookies are light, crisp and chewy, made with basic ingredients like oats, flour, butter, sugar and spices– then once baked they are sandwiched together with melted dark chocolate. If you’re baking cookies for Holiday parties, or just to leave Santa, these are a must! love it and making it again today! I made this recipe yesterday. The cookies are delicious and my husband loves them, too. I spread chocolate on the backs of each cooking, marking them with a fork, keeping them as individual oookies. I saw the fork and individual cookie technique during the Great American Holidy Baking Show technical challenge for cookies. Gina, is the dark chocolate semi-sweet or unsweetened? I saw many kinds including some with %.. Pretty overwhelming. I shop at Meijer. No Trader Joe near me. TIA. 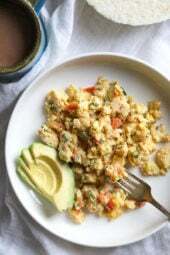 I put the recipe into the WW recipe builder and 12 servings is 6 pts. if you substitute the sugar with splenda it is 4 pts per serving. Did I get the serving size wrong? Not fore the novice baker. 4 minutes in the oven they were black. So, I added more stuff to the recipe and made traditional oatmeal/chocolate chip cookies. I think I’ll just have the single cookie and not the chocolate cookie sandwich. These are delicious! Is it supposed to say 1 level tablespoon in lieu of teaspoon? I ended up with 48+ single cookies using a teaspoon measure. These look amazing! I have a relative with a honey allergy, could I use corn syrup or agave? Thanks! I am making these right now–based on my sampling, they are SO yummy!! But the WW smartpoints are miscalculated…one cookie sandwich (based on 1/12 of the recipe) is actually 6 points, not 3. Oatmeal cookies and I have NEVER gotten along well. EVER. Today I tried these and they were a FAIL. I think I narrowed it down to the use of raw organic cane sugar. I forgot that it tends to make things chewy and the cookies were a floppy mess. But I got a huge laugh out of it. I am a great cook and baker but I think I will keep clear of oatmeal in the future. 🙂 I did add more flour to the second half and they came out better. Not the way the should have – but better. NO FAULT OF YOURS GINA! You are still the best!!! Can you add cocoa in place of some of the flour to get a chocolate lace cookie? I made these today, but I didn’t have dark chocolate. Instead, I added a tablespoon on cocoa powder into the mixture. They turned out awesome. The only concern I have is when I added it to my weight watchers recipes, it said 5 smart points per serving and this recipe on here says 3 smart points. Either way, they are worth the points. These are absolutely AMAZING. I made these along with 2 other types of cookies, sent them into work with my husband and they were handsdown the best of the 3. I’m making these for a cookie swap this week!!! Gina, your recipes are the BEST!!!!!!! Everyone loves these cookies!!!! i was wondering if I can make this cookie dough the night before i bake them? I haven’t tried it, I would suggest letting the dough come back to room temperature before you bake them though. Hi Gina I made the lance cookies delish but they came out thick not thin why? Hmmm…not sure. Mine easily spread. My mom requested a lighter dessert for this upcoming Thanksgiving, so I just gave these a test run. They came out perfectly! I see some are having trouble and I would say certainly use a silpat instead of parchment paper. Thanks for another winner Gina! I just made these last night for a holiday party and they were a hit! The only change I made was that I replaced the flour with Bob's Red Mill Gluten Free 1-to-1 Baking Flour. They turned out perfectly crisp and looked so pretty! Thanks for another great recipe! Would you be able to use Coconut Oil in place of butter for these? They look delicious! Can you refrigerate the dough for use at a later time or would that harden the cookie up? Am in UK How many ounces or grams is in a cup measure? Would using coconut or almond milk be ok? I don't drink regular milk and never buy it for cooking either. all I have on hand is "quick cooking" oats. I assume I can use that and the cookies just won't be as "lumpy" ? All I had were quick oats as well (Quaker). I noticed it said old fashioned oats after I put them in the oven 🙂 I found the cookies were a little chewier than typical lace cookies, but they still taste great! You did it again! I cook when I'm stressed and I crave sweets when I'm studying, so when I saw this cookies a few days ago on Pinterest I just knew I would end up making them. I just did and they are amazing! It yielded 43 cookies and they spread beautifully, and even though my oven is tiny and I had to bake them in four batches they were pretty quick to make. My advices for anyone having trouble are: level the teaspoons, use real butter (because it may alter the texture and spreadability to use vegetable shortening or other alternatives – its just 1/4 cup for the whole batch anyway, not that much cholesterol), make sure you melt the butter until its completely liquid and bake smaller batches if needed (I burnt a few cookies in my first batch but then I reduced the size of the batches and they cooked evenly). Also be careful, they are so thin they can go from raw to burnt in literally 1 minute, if they're golden take them out, even if they're still bubbling. I made these over the weekend and got the highest praise from my man. He declared these the best cookies I've ever made. I do bake fairly often too, and not all healthy cookies (though mostly). Your oatmeal cookies are my personal favorite and I have fun using different types of chips, dried fruit and nuts to mix it up. These will for sure have to go into the rotation. My first batch didn't spread at ALL so when the next tray when in, I flattened them first and they turned out perfectly. The batter is RIDICULOUS, so tasty. Yum yum. And my third batch was the best – I flattened the crap out of them first. These cookies turned out PERFECT and were a huge hit! 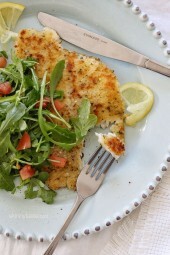 Thanks Gina for another fabulous recipe! I got 35 sandwiches. Clearly, I shorted each of the teaspoons! I did use about an ounce of the chocolate. My cookies did NOT spread. I have to wonder if I over mixed? Everything else I followed to a "T". If I make these again, I will use a heaping teaspoon and be very careful not to over mix. Made these this afternoon. Spread great; got 41 vs 44. I had problem knowing just when to remove from the oven. …and using 3 different cookie sheets that each cook differently. My biggest problem was with the chocolate. I used 1 oz, and the chocolate is so thin the two do not stick together. Maybe after sitting a while they will. I will make again; however, next time keep as single cookies and not use any chocolate. I made 2 batches of this very delicious cookie. I got 11(22) cookies from the first batch and 12 (24) from the second batch. I'm wondering if you used a measuring teaspoon to measure out the amount of batter. A suggestion for those who are having difficulty removing cookies from the pan. I moved all the cookies with the parchment paper still attached directly to the cooling rack. 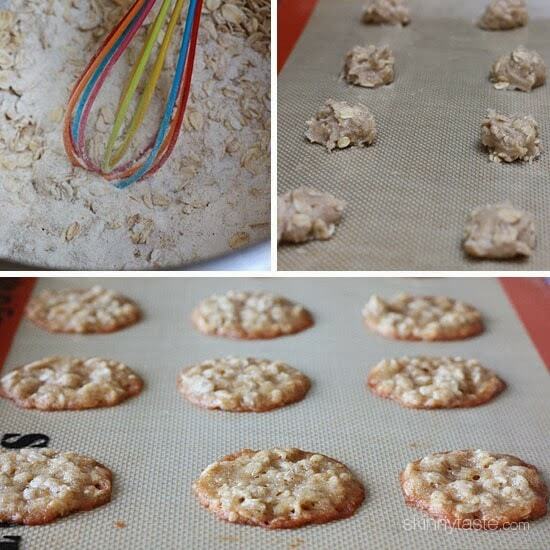 Once cookies were completely cooled I was able to peel the parchment paper off easily. "I'm wondering if you used a measuring teaspoon to measure out the amount of batter." Yes, you do. One level teaspoon, as stated in the recipe. would a blend of gluten free all purpose work in this recipe? Good question, I am going to try! For those whose cookies didn't thin out and/or the recipe didn't make 22 sandwiches – be sure to follow the recipe exactly and use one *level* teaspoon for each cookie. That's probably not as much dough as you're used to when making cookies. 🙂 Take a measuring teaspoon and scoop it in the batter, then use a butter knife to level it off. Gina's recipe worked perfectly for me and it even made 24 sandwiches. Delicious. They are great. Followed recipe as stated. Cookies thinned out however, I think when I make another batch I'm going to keep them single and dip in chocolate rather than create sandwiches. Sandwiches are a little thick and keeping to one will allow me to give more away for the holidays! I just made these and they are delicious! I did not get quite as many as you (only about a dozen sandwiches) and used a little more chocolate but still delicious! For those who commented that the cookies didn't spread out – maybe they used softened butter instead of melted? Or maybe oven wasn't hot enough? Just a thought. 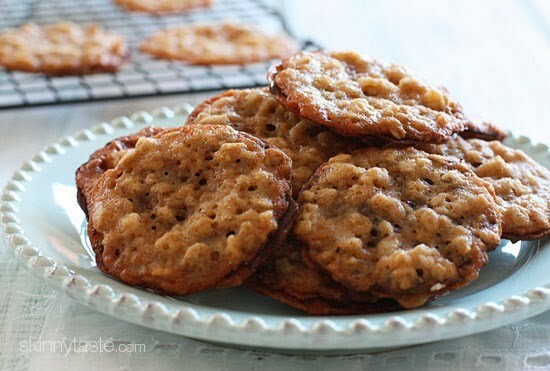 Came across these while searching for an eggless cookie recipe so my youngest didn't feel left out. Wasn't going to try it after reading the reviews, but went ahead and was glad I did. Followed recipe exactly and came out w/ 24 sandwiches. They were a little crispier than I expected so I'll probably take them out of the oven a little sooner next time, but they are delicious!!! I just made these and they were SO good. These turned out perfectly for me…I got SO many compliments. Just the right combination of chewy & crispy! can you make these ahead and freeze??? also, i have one child who is gluten intolerant so can i use GF baking mix instead of flour? Ugh! They smell so delicious…I just can't get mine to spread out and get thin and pretty like yours. Followed the recipe to a T! I tried this recipe tonight and it turned out fabulously. I made one baking tray with 2 tsp of dough, and another tray with 1 tsp as per your recipe. The cookies made with just 1 tsp turned out 'lacier' than the larger mounds of dough (which is what I prefer! ), so I just wanted to leave a comment that your instruction to measure out 1 tsp of dough was right on! Made these tonight… delicious!!! I made them exactly as directed and the 1 tsp did, indeed, spread out to be the same size pictured in the recipe. I also got exactly 22 sandwiches. It says under a reply that you remade these with agave. Did you replace the honey with agave? and how much Agave did you use?? These look so marvelous! I wish I could jump in the screen right now and steal one! I also had bad results: did not spread (I carefully used 1 tsp.measure). Also, came out kind of dense – not "lace" cookie material. 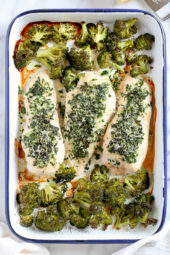 I baked on well seasoned stoneware bakesheet – no problem with them sticking, but just was dissatisfied with whole recipe. Just made these and not only are they delicious, they are so pretty! I just made them and just used a whisk to combine the wet ingredients and they came out fine. Thank you Gina. I just discovered your blog and have already made two recipes. You are the bomb! Never made a recipe of Gina's that we didn't like. One of my favorites are her soups. I am a believer in Gina! These are awesome but I have to say the pictures make them look so much bigger! Mine turned out about an inch big and about the thickness of a tortilla. If u make them on a meteal pan deffinitely make sure u only cook them for about five minutes and use parchment paper or else they get to done and stick and let em cool longer before you put em on the cookie sheet. All in all these are really easy and yummy too! Yes, I was thinking that the dough as pictured on the cookie sheet was a lot more than one teaspoon. I think you would have to double the point count for the size of cookie shown. JMO, but I haven't made them, so it is only an opinion. oh yum, i love lace cookies! excited to try these. I'm not so sure honestly. 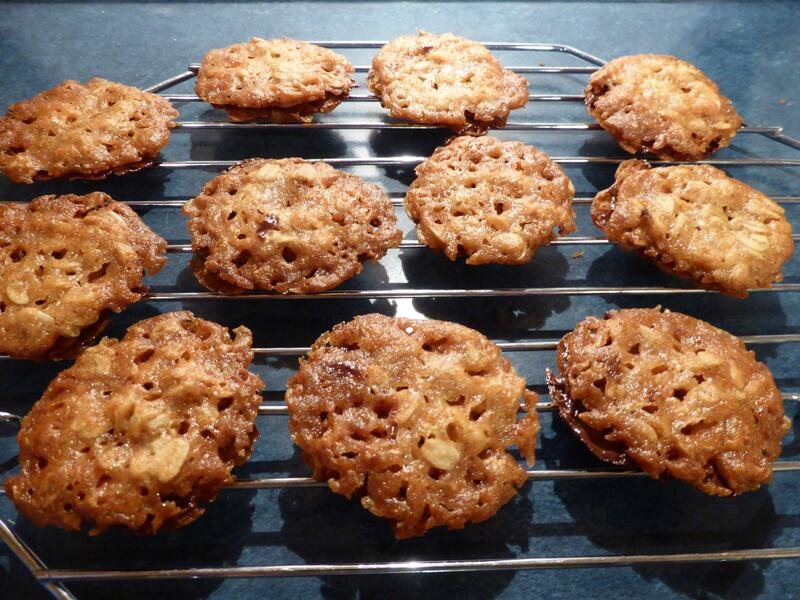 I made these with quick oats and they turned out, what I would consider to be, a little too thick and way to hard. Maybe I did something wrong, but they were difficult to bite into. 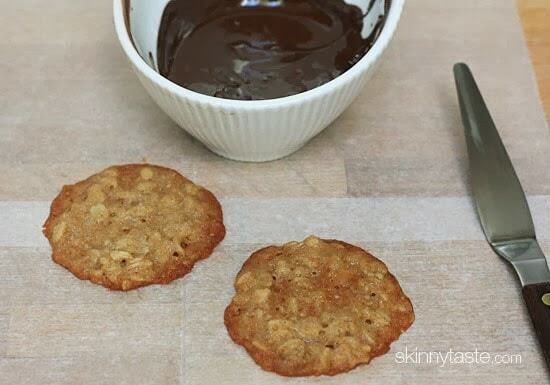 To make them go farther, after you spread the chocolate on them, place it chocolate side down onto chopped almonds and don't sandwich them. YUM!! These are going in my holiday baking routine! When you say 1/4 cup butter melted. Is the butter measured before or after it is melted? These look wonderful, Gina! Baking cookies with my kids is one of my favorite holiday traditions. I have all of the ingredients for these and am thinking of making a batch today to give to my neighbors. Hi! What are old-fashioned oats? These look great, I have made this type of cookie in the past but I have never sandwiched them together with chocolate before! What a clever idea – thanks for sharing! I made these tonight and they came out delicious! I had one small snafu– mine did not spread out nicely like yours. Did you press them down before you put them in the oven? The only change I made to the recipe was using agave instead of honey. Also, I mixed them by hand instead of using a stand mixer. Could either of those factors have anything to do with it? Also, I halved the recipe and it only yielded 12 cookies (6 sandwiches). I was careful to only make each a teaspoon. Any ideas about what might have gone wrong? I will be making them again because they were delicious, but I want to make sure they come out as pretty as yours next time! Perhaps something went wrong when you measured the recipe? I just remade them with agave using a hand blender and I got the same amount of cookies as before, and they spread out nicely. the minute they came out of the oven, I was able to reshape them into perfect circles with a knife. Then I slid the knife underneath ch cookie and they came right off the parchment paper. My mom made oatmeal lace cookies every Christmas. Thanks for posting these. These look incredible & I plan on making them this week for a cookie exchange. Question…I don't have a stand mixer. Could I use a hand held mixer instead? Will that still be effective or will it compromise the consistency of the cookie? Could you substitute splenda cooking sugar instead of regular sugar? I haven't tried it but I think it would be fine. Don't! I subbed stevia instead of sugar and they did not spread at all. Threw the batch out and started over with half stevia/half sugar. These cookies look great and so delicious! I love less calories. Thanks! that’s what mine worked out to be, anyway. they’re still cooling, but look fantastic! Oops! Yep. Fixing it now. Thanks for noticing. Wow! I'm putting these on my cookie list! They look absolutely delicious! I just made your cranberry pistachio bark for gifts! Was a big hit! Could I just use 2 oz. of a hershey special dark chocolate bar and melt it in the microwave for the filling? Thanks for another great recipe! Yes, that's exactly what I did with Trader Joe's dark chocolate. Wow so far! I love these cookies, and I'm really not a cookie person. Enjoy! Will this work with skim milk as opposed to 1%? I'm sure that would be fine, any milk you have on hand.